In 2015 plans to replace the insufficient lagoon system plant formally commenced and Hussey Gay Bell was engaged by the Town to plan, design and oversee construction for a new greenfield facility to double the plant’s capacity which will bring the treatment facility in line with the State Department of Health’s new guidelines for discharges into the public water system. 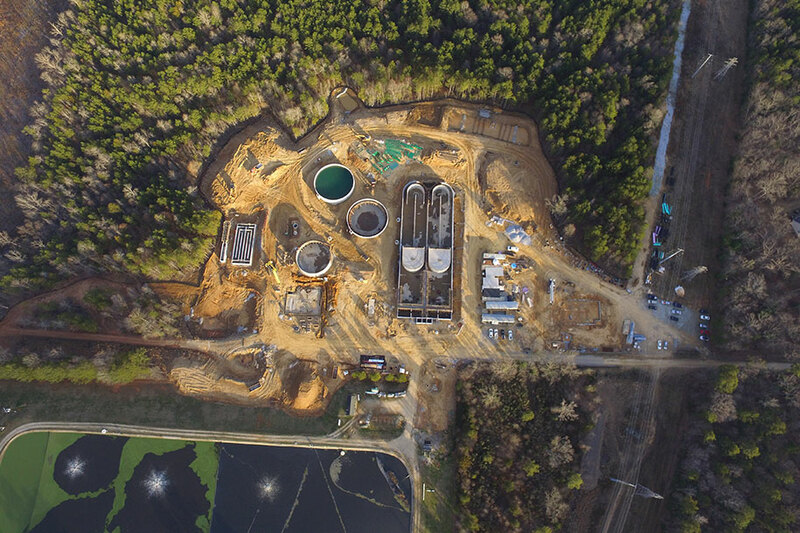 The Town’s existing 2.4 MGD aerated lagoon system wastewater treatment plant is located on a 13.7 acre site on Hollyoak Lane close to Chapin and the I-26 interchange. 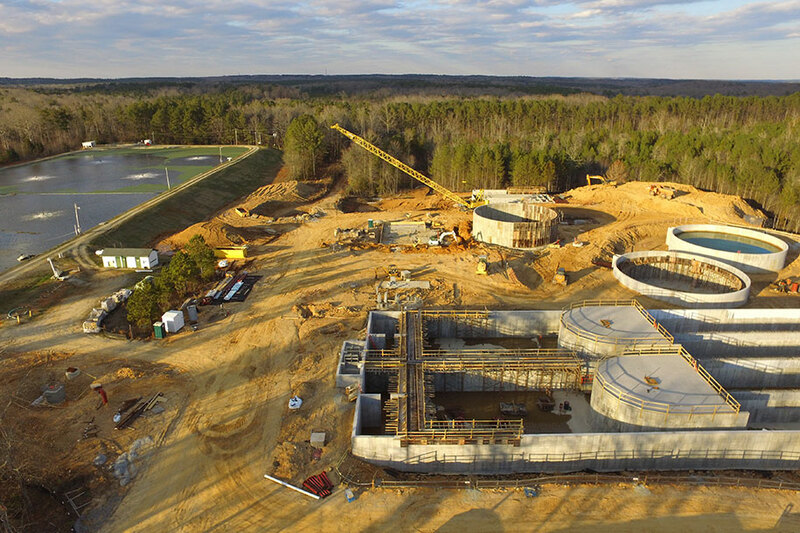 The new $13.5 million wastewater treatment facility is sited on approximately 33 acres on the eastern side of Holly Oak Lane and adjacent to the existing wastewater treatment facility. Significant new features of this project include a headworks facility, primary clarifier, splitter box, and a drain pump station. Construction will require over 450 tons of reinforcing steel and 5,000 cubic yards of concrete, 50% for the new aeration basin. Integral to this project is the modification of the effluent discharge. The existing discharge is accomplished with a force main pipe that is energized by static head alone; there is no pump station. The effluent line was evaluated with hydraulic calculations to determine at what flow the friction losses through the existing effluent line would overtake the energy created by the static head. Once the flow was determined to be about 1,800 GPM, then a pump station was designed that would begin pumping once the flows through the plant exceeded that level of flow that the existing effluent line could handle. The design of the pump was such that the pump did not operate during the lower flows, saving on energy costs, and the pump would only be activated at the higher flows. The project is being constructed by Columbia, South Carolina-based, M.B. Kahn and is expected to reach construction in mid-2019. 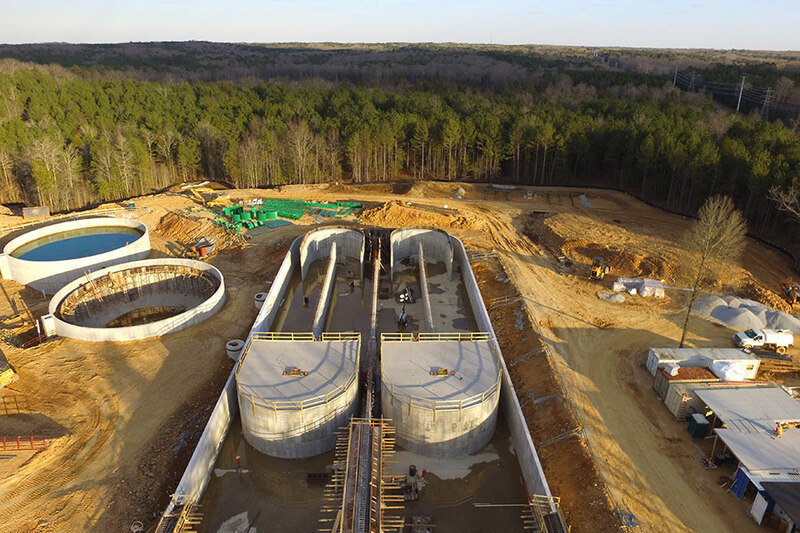 The conversation to expand the Town of Chapin’s 1.2 MGD lagoon system treatment plant began nearly 20 years ago in 2000. When the Town went into the sewer business to serve the Timberlake area many years ago, they began to use an aerated lagoon to treat their wastewater. As more people asked to tap on, more un-treated sewage went through the system, was treated by that process, and then ran through an outfall pipe approximately 5-miles where it discharged into the Broad River. 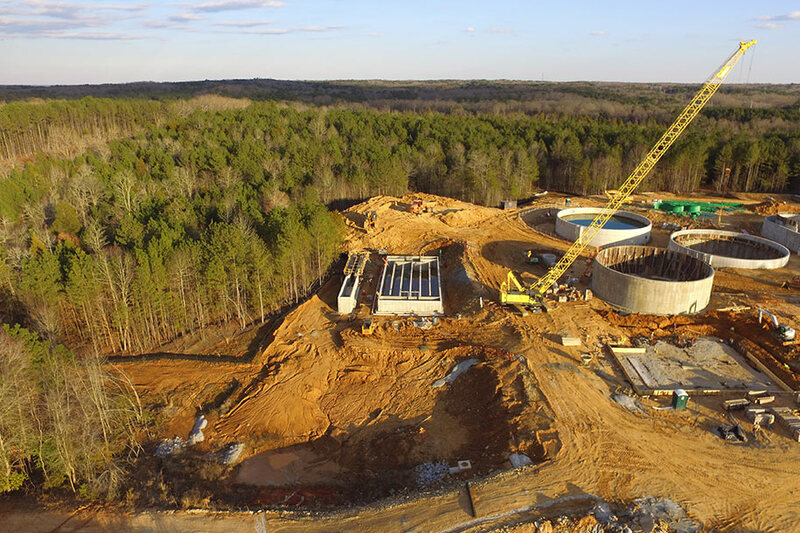 Now, not only has the extra customers and demand created a need for an upgrade, but environmental standards have been raised that have made it necessary for Chapin to better treat their waste discharge.